We have to start this post by just saying thank you. Thank you for sharing our love of furniture flips and painting random beat up old furniture gems we find on Offer Up. And thank you for loving us even when the DIY furniture flip stories are less than perfect and a hilarious, beautiful mess. Thank you for allowing us to do what we love, share it with and for your always glowing response to these little DIY projects of ours. It fills our hearts with so much joy and we're just so grateful you're here! So, now that that's out of the way, behold one of our very favorite DIY furniture makeovers that we've ever, ever done. 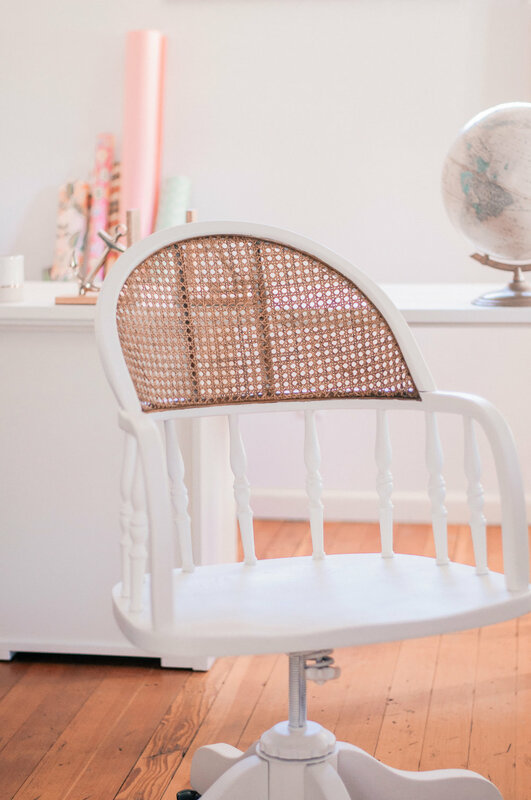 Yes, it's just a desk chair and yes, it's about as easy a DIY project as it gets and the colors certainly aren't anything novel (though we really just couldn't love white any more), but we love the end result so much and that's mostly because it's exactly what we envisioned in our heads when we started the project. Always a win in our books! 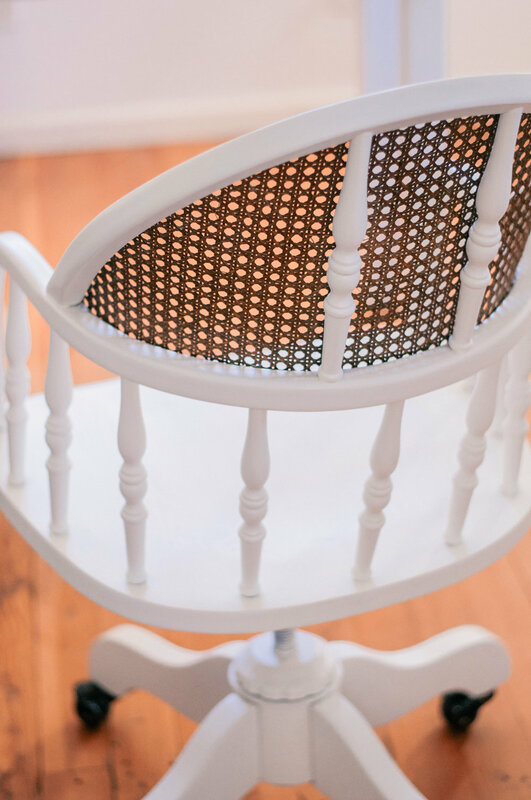 We've been obsessing over all things cane as of late and we've especially had our eye on the pairing of a white chair frame (bentwood or otherwise) with a natural cane back. There's something about the contrast that's just so fresh and fun. And though we're not yet ready to tackle a total makeover formiue outdoor office "She Shed" just yet, I saw this bentwood desk chair with cane backing on OfferUp while searching for cane dining chairs, and immediately knew that this was my next project, even if it would only slightly upgrade the office space. I've been using an old plastic pink Ikea desk chair from college for over a decade because it worked just fine (practical, I tell ya), so an upgrade was long overdue. This was just the thing! 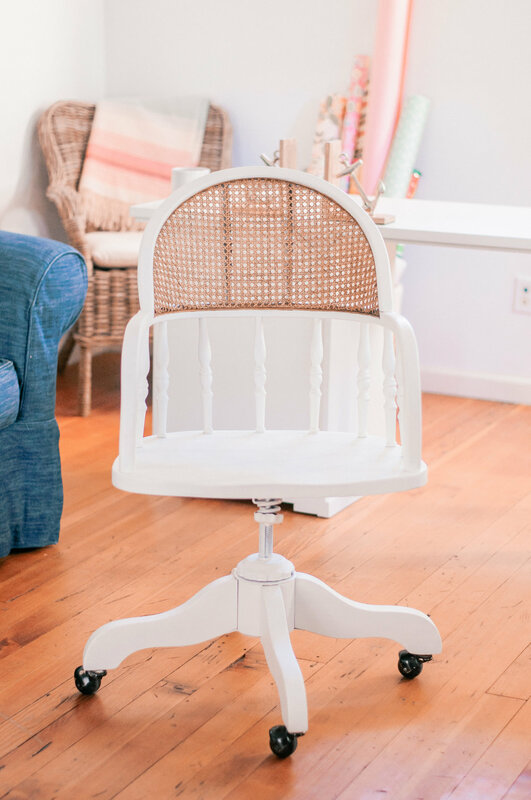 Since I'd been pinning tons of inspiration for chairs with white frames and natural cane backs, we knew exactly how we wanted to makeover this chair - sand it, tape off the cane with serious precision, paint the frame with a pleasing white paint and BAM! Beautiful new desk chair. Of course, there were a couple of bumps along the way, but would it be one of our DIY projects if there weren't? No. No it wouldn't. First, we had to drive about 40 minutes at the crack of dawn on a Saturday morning to get this chair in a pretty questionable part of town. I won't go into too many details, but our interaction with the seller was about as comical and wacky as it gets, but luckily the chair was absolutely perfect and just as good a find as I thought it was - no major structural flaws and mechanically it all worked as it should. 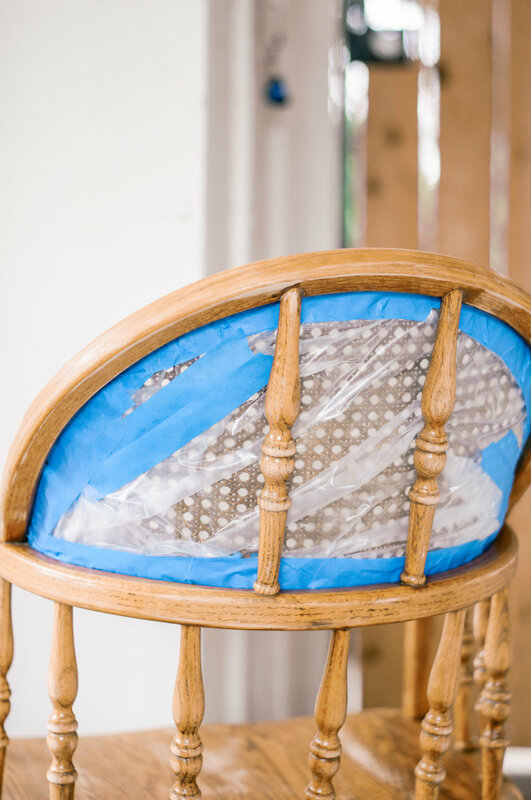 Then after all of our prep work on the chair (which we go through in detail in the How To steps below), we decided we were ready to paint and that we'd do it with standard bright white spray paint. We don't normally go the spray paint route anymore, but we thought it would be our most fuss-free option and that the bright white would give us the look we wanted. Naturally, when I woke up in the morning after painting I hated the color. It was way too stark a white. Way too sterile. Not cute at all. I also realized that it didn't match the white of my Pottery Barn desk, and that was no good. 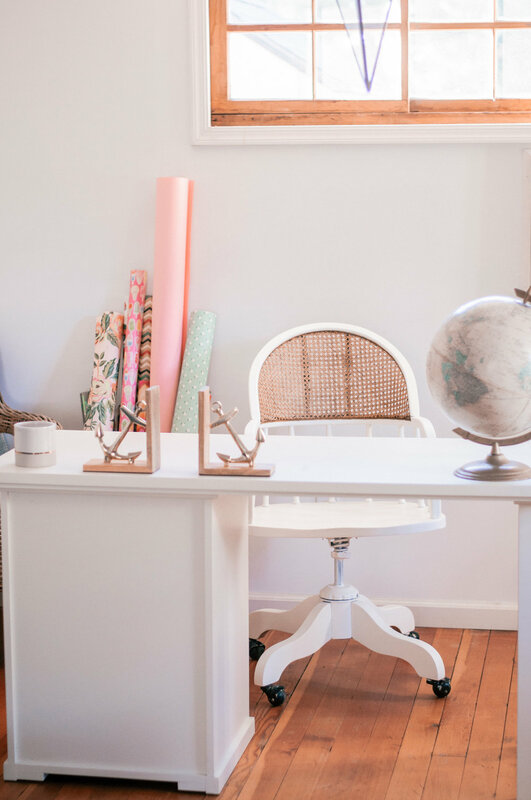 And yes, I totally should have considered matching the white of the desk during the planning portion of this project, but I was just so excited about the chair and getting to work that I admittedly disregarded that aspect of it. Typical! 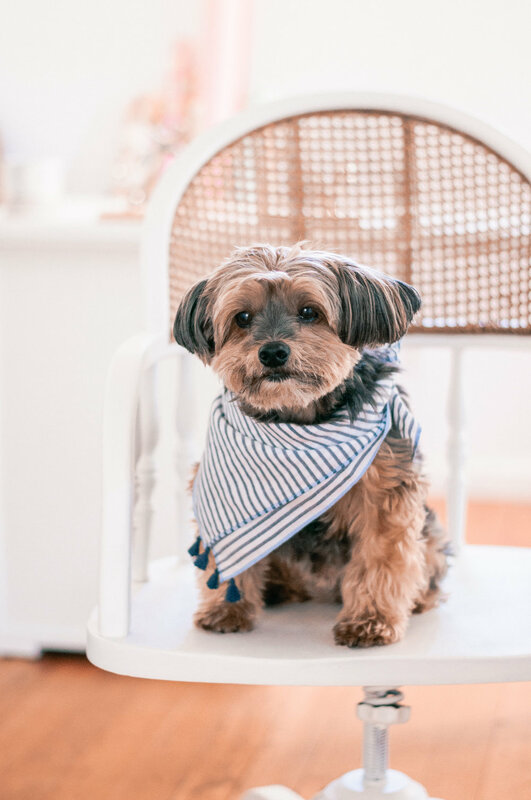 Pottery Barn doesn't sell their paint colors, so we'd have to figure this one out on our own. 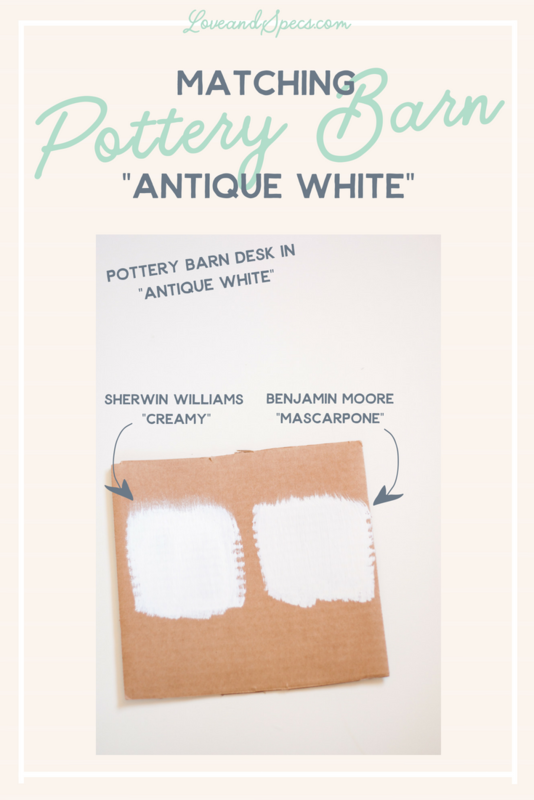 After a little bit of research, it seemed that a few of our fellow DIY furniture flippers out there had come up against the same problem of trying to match Pottery Barn's "Antique White" color (the color of the desk), and had decided that two colors were pretty perfect matches - Benjamin Moore's "Mascarpone" and Sherwin Williams' "Creamy". There were solid arguments for both and in different lights, I think both can be spot on. So I grabbed a sample of both colors to make sure I found one that I absolutely loved and that looked perfect with the desk in the light in our office. The winner? Sherwin Williams' "Creamy". To be totally honest I actually think that "Mascarpone" is probably a truer match (as you can see from the pic), but "Creamy" was darn near perfect and I just liked that color slightly better in general. Benjamin Moore "Mascarpone" is a little bit more yellow than "Creamy", as you can see, though not overly so. It's still such a nice off-white. But I really liked that Sherwin Williams' "Creamy" was a cooler off-white and was excited about the idea that it would pull out the brighter white side of the desk in general. So "Creamy" it is! 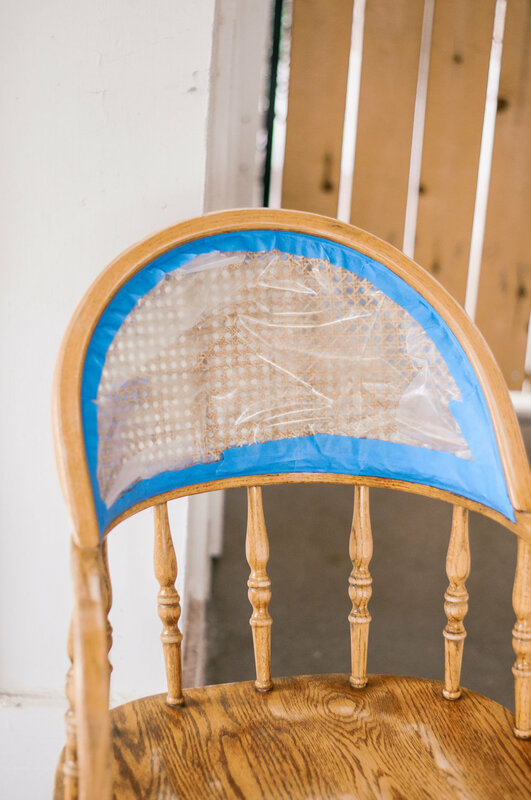 We also decided that we wanted to hand paint the chair rather than use the airless sprayer (which is what we would have had to do if we wanted that perfectly "sprayed" look on the chair), and I absolutely love the end result of the paint job on this chair! It was exactly what we’d evisioned, and that's such an awesome feeling. Not only was I pretty impressed with the fact that my prep job in covering the cane was so precise (not a speck of white to be found on that cane backing), but "Creamy" looks so good on this chair, pairs perfectly with the desk and the satin finish was definitely the right finish for the project. And I'm so glad we hand painted rather than sprayed. No disasters to be had, which is kind of a miracle in my eyes! One other cool piece of this project that worked much better than I thought it would was repairing the "bubbles" in the cane. And when I say "bubbles" I mean that there were parts of the cane back that had sort of bubbled out and clearly become a little bit misshapen over time, which can happen to cane. So I needed to learn how to re-shape the cane to get it back into its original smooth, flat crescent shape that runs along the back of the chair. After a little bit of research, I learned that I could wet the cane, use something to hold it in place and re-shape it, and then use a hair dryer to dry the cane and mold it in place. I thought that attempting this would mean disaster and that I'd find some way to screw this up, and yes, I totally used the water bottle I used to wet the cane to re-shape it and hold it in place while I dried it, which was the best I could come up with on short notice, but you guys... it totally worked! Shocking, I know. I think I screamed with joy and scared Chris to death when I saw the end result and that the process had actually returned the cane to its original, flawless shape. But beware: dried out cane is a bad thing and can ruin it beyond repair, so you have to be really careful and quick with the heat. I used the low heat setting on my hair dryer and probably only dried it in place for about 20 seconds, and lightly sprayed the cane again with water once I was done do give it more moisture. Turns out, that was just the ticket. No dried-out cane to be seen! 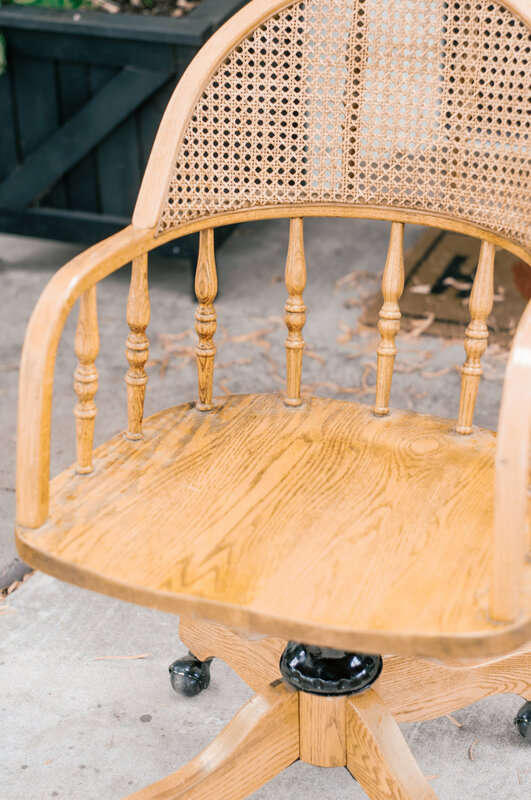 I hope you guys love this easy little cane chair makeover as much as we do. Isn't it funny how sometimes the simplest projects bring you the most joy? 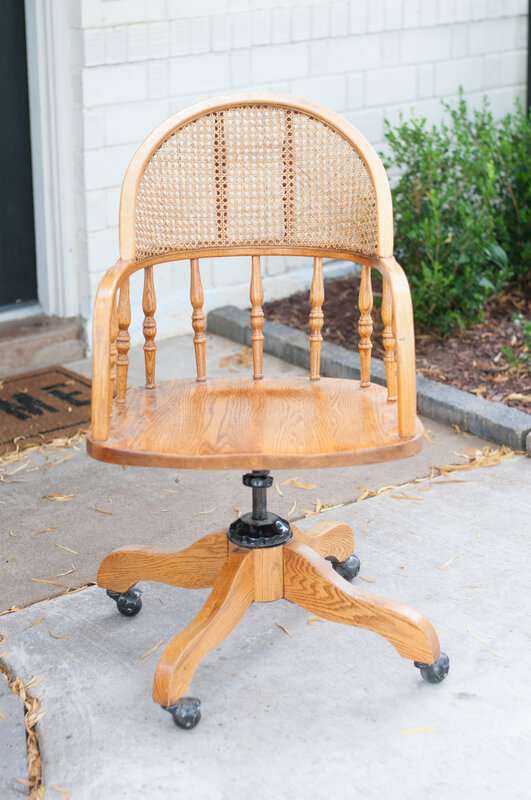 I'll be enjoying this chair every day and hopefully, we can use what we learned with this cute cane chair makeover and find some cane dining chair gems for our breakfast table that we can give the same kind of facelift. So if you need me, I'll be over here scrolling OfferUp every 5 seconds for the perfect thing. Until then, we've got about 765 other DIY furniture flips on our list to get done, so stay tuned for more triumphs and mishaps... in equal measure! Sherwin Williams Satin Finish Interior Paint in "Creamy"
1. First we sanded the seat, legs and bentwood frame of the chair using a finishing sander and 150-grit sanding squares. For the more delicate spindles use a 150-grit sanding block. We sanded until the varnish and stain were gone. 2. Then we brushed the dust off with the large brush, and made sure to get in all of the crevices of the spindles with the smaller wire brushes. 3. Before I wiped the chair down, I tackled re-shaping the part of the cane that had "bubbled" out. As described above, I sprayed the cane using a water bottle, wiped it down with a rag so it wasn't overly wet. Then I used that same water bottle to hold the cane in place and re-shape it where I wanted it, and then used a hair dryer to dry the cane and mold it back in place. Hopefully the images help provide clarity on what that process looks like! 4. Once the cane back was re-shaped, I wiped the chair down thoroughly (I had to be especially thorough on all of the crevices on the spindles) with a damp rag to get all of the rest of that sanding dust off. 5. Then I taped the cane off very carefully and precisely using standard painters tape and plastic tarp. One tip: I'm not a huge fan of using newspaper for something like this if you're spray painting or using an airless sprayer because it's so porous, especially if you're using more than one piece of newspaper to cover the surface area - that's a recipe for paint to get through the breaks in paper. But if you're hand painting like we did in the end for this, you can use whatever works for you! When you're hand painting it's the borders that are the most important to keep protected, and the painter's tape kind of takes care of that. We also taped off the metal casters on the chair because we couldn't remove them and painting them wouldn't have looked awesome. They're perfectly worn, so they add a little bit of character as they are! 6. Once the cane was completely covered and all of our prep was done, we were ready to paint. I love using this brush for hand painting furniture like this because it's flexible and allows me to get in all of the corners. It worked like a charm this time! Painting the spindles took a little bit of patience and I used a smaller brush for those so I wouldn't get drips and paint pools around the curves. Otherwise, painting this chair was easy and straightforward. 7. After I was finished painting I wondered whether I should add some sort of clear coat on top to protect it. After FaceTiming my mom and grams the consensus was that no, this particular paint formula wouldn't need it. Also, when you use a top coat of any kind there's always the potential to discolor your paint job or even strip some of it, which is no good at all. So it was good to go!